Collected Letters is a study in the unity of differences. English and Chinese. Old and new. Tangible and ephemeral. Accessible and esoteric. Reverence for the past and exploration of new, uncharted territories. 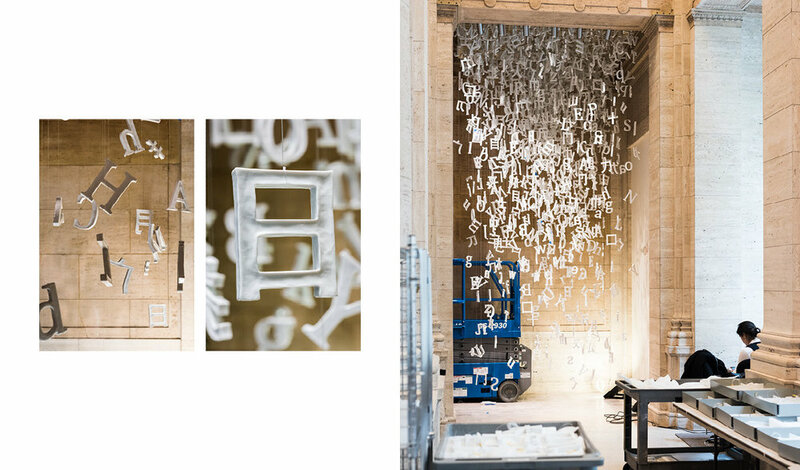 Its comingled, suspended, white porcelain forms—the letters of the Latin alphabet and the radicals that form Chinese characters—are the building blocks of language and communication, yet in this installation they never come together to form readable words. They are the deconstructed complements to the books that filled the Asian Art Museum building when it was San Francisco’s Main Public Library. Wise, anonymous maxims inscribed on the upper lintels of the Loggia remain as reminders of the building’s former life. This new assemblage of white radicals and letters nods to the past while presenting tempting possibilities for yet-to-be-written prose and poetry. Taken out of their utilitarian context in words or sentences, letters and radicals can be seen as sculptural compositions in their own right. The graceful curve of a lowercase “e” or the pleasing symmetry of the radical “?” (kou, mouth) can be appreciated with fresh eyes. Simple, familiar shapes are made new again. Unfamiliar shapes, to those not literate in both English and Chinese, are made more approachable. They are simultaneously plain and lustrous. This beautiful illegibility is refreshing to modern eyes that are so accustomed to an overabundance of unedited text. It is this type of powerful resonance with the world we live in, nostalgia for a world that once was, and hope for a world that might be that reveals the depth of this deceptively simple artwork and the skillful hand of the artist Liu Jianhua.